Air Plant Terrariums | Make A Terrarium! Air plants make great terrarium plants because they grow easily and are simple to care for. They're perfect for beginner terrarium maker because they are almost impossible to kill, and can grow in almost any thing. 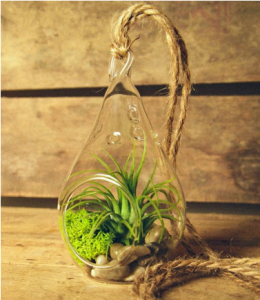 Air plants are epiphytes, which means they don't need soil to grow. They absorb all their nutrients and water through their leaves. Even though they have roots, those are used for anchoring the plant to a whatever it's growing on rather than absorbing nutrients. Since they don't absorb anything through their roots, you don't even need soil in your air plant terrarium. Many people use small pebbles or sand as a base, which makes for an attractive desert landscape look. Caring for air plants is easy. Mist the leaves with water a few times a week. You can also take the plant out and soak it in water for a little bit. Make sure to let the plant dry out before putting it back though, or else it will rot. Don't let the roots stay wet either. Place your air plant in indirect sunlight close to a window. Make sure it's not in direct sunlight, or the heat could reflect through your glass container and overheat the plant. There are plenty of places online where you can buy air plants. Click here to view our favorite supplier .